Largo, MD – May 31, 2018 – On Tuesday, June 5, 2018, the Council on Legal Education Opportunity, Inc. (CLEO) continues its year-long commemoration of its 50thAnniversary with a salute to individuals, law schools, and organizations that have had a significant impact on DIVERSITY in legal education, the profession, and/or society during the Diversity Reception at Google Downtown in San Francisco. 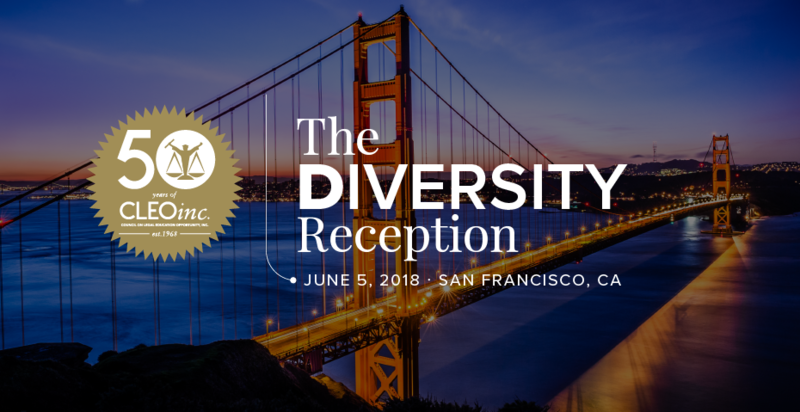 Focused on the theme, “The CLEO EDGE: 50 Years of Championing Education, Diversity, and Greater Equality in the Legal Profession,” CLEO will recognize more than 180 nominees for the CLEO EDGE Award for Diversity. In addition to the nominees, the program will feature testimonials from CLEO alumni and CLEO Fellows in the San Francisco area. Individual nominees from California include: Ruthe Catolico Ashley, Executive Director Emeritus, California LAW, Inc.; Jay Austin, Assistant Dean for Admissions and Student Financial Services, UC Irvine School of Law; Devon W. Carbado, Associate Vice Chancellor of BruinX for Equity, Diversity and Inclusion, The Honorable Harry Pregerson Professor of Law, UCLA School of Law; Cheryl I. Harris, Rosalinde and Arthur Gilbert Professor in Civil Rights and Civil Liberties, UCLA School of Law; Shauntrice Martin, Executive Director, Bay Area Urban Debate League; Elisa Shieh, Law Fellow at UC Davis, volunteer for the Asian Pacific Islander Legal Outreach Clinic; Leigh Taylor, Dean Emeritus and Professor of Law, Southwestern Law School; and Frank Wu, Distinguished Professor of Law at UC Hastings College of the Law. California law schools to be recognized include: University of California Davis School of Law; University of California, Hastings College of the Law; University of California, Irvine School of Law; University of California at Los Angeles School of Law; University of La Verne College of Law; Southwestern Law School; and Thomas Jefferson School of Law. Seattle University School of Law is an additional nominee in the northwest region of the country in the law school category. Other individual nominees in the northwest are: Sandra Madrid, Special Assistant to the Vice President for Minority Affairs and Vice Provost for Diversity, the University of Washington; Peggy Nagae, Consultant and Program Director, Center for Asian Pacific American Women; and Kimberly Jade Norwood, Professor of Law and Professor of African & African-American Studies, Washington University. “We are pleased to recognize these outstanding people and institutions whose commitment to diversity and inclusion is unwavering. They understand that diversity and inclusion are more than buzzwords, they are the keys to success in legal education and our society,” stated Cassandra Sneed Ogden, CLEO’s Chief Executive Officer. More than 150 people are expected to attend the event. A reception centering on contributions to GREATER EQUALITY will be held in New York on September 12; a reception focused on Education was held in Houston on April 26. On Thursday, November 15, 2018, in Washington, DC, the CLEO EDGE gala will round out the historic celebrations where 50 finalists in each of the three categories will be honored. For a complete list of diversity nominations, please visit https://cleoinc.org/50/50-for-50/diversity/. CLEO, Inc. is a 501(c)(3) charitable organization committed to diversifying the legal profession by expanding legal education opportunities for persons from traditionally under-represented racial and ethnic groups, low-income, and disadvantaged communities. Founded in 1968, when the number of lawyers of color was less than one percent, CLEO has produced more than 10,000 individuals who have excelled in every area of the legal profession and include judges, corporate attorneys, law school deans and professors, practitioners, politicians, and more. 2018 is CLEO’s golden anniversary. More information about CLEO’s 50th Anniversary, the DIVERSITY RECEPTION, or how to RSVP can be found at https://cleoinc.org/50/.